Hello loverlies! 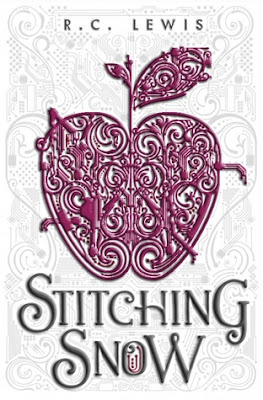 I have been debating on reading this book called Stitching Snow by R. C. Lewis for a good while now. I finally found it at the library to pick up and read. yay! When I started out reading this I had no idea what was really going on. I just knew this girl Essie who lived on thanda, would always fight to win money. With that money she would repair her drones that she sent to help the men in the mine. There was something in the mine that would leave some type of dangerous sludge that you could come across if you were not careful. The drones had a detecting system to tell where the men to stay away from. Essie enjoys stitching/coding these drones. I actually fell in love with the drones, because I just thought they were adorable! It was interesting how they each had their own personality and you could tell they even had feelings. At least that is what I caught from them. There is a lot more I can tell y'all but I don't want to give away the whole story. I found this book, actually quite easy to get into reading. I enjoyed how the main character was smart, strong, and always tinkered with her drones. I believe Lewis did a wonderful job and her book is well written. It had me quite on the edge of my seat at times, because there is a lot of fighting and action. The last part of the book was harder to read, because of me being an anxious person. It was where most of the story got to an emotional part for me. I would say this book is a buyer. After reading it, I can catch myself reading it again. Another plus it will look beautiful on your bookshelf because of the cover. There is another book Lewis wrote called Spinning Starlight. I am definitely going to check out of the library to read. I enjoy her writing style and the plot she comes up with. If you enjoy fighting and action, and don't forget the love story. Then I believe you will enjoy this book like I have. Have a Blessed Day!